Although giant pandas spend most of the day eating and sleeping, they love to climb and play. 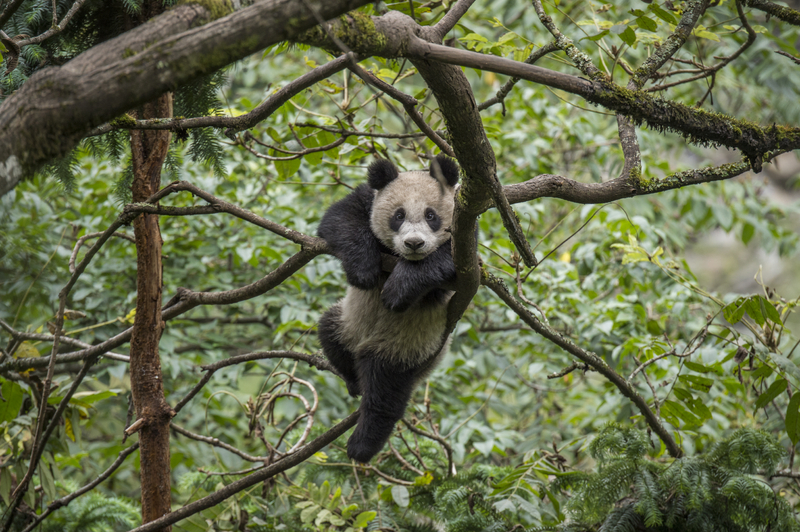 Here a year-old cub explores the treetops in an enclosure at Wolong Panda Reserve. If it passes tests to gauge its survival skills and instincts, it may be released into the wild. Pandas, I learned from multiple trips to China and countless hours spent in their presence, are far more complex than their image suggests, and they offer powerful lessons as species across the globe are threatened by habitat loss, poaching, and climate change. They also own a success story that, while tentative, is all too rare. In 1990, the global wild panda population was approximately 1,100 individuals, and the International Union for Conservation of Nature placed them on the endangered species list. After years of research, scientists have learned how to successfully breed pandas in captivity. With an adult population estimated at more than 1,864 wild pandas and 500 captive pandas, they have been upgraded from endangered to threatened. In a region where bad environmental news is common, China is on its way to successfully saving its most famous ambassador. And they are now working to reintroducing them into the wild. See my National Geographic Story, Pandas Get to Know Their Wild Side, to learn more. This photo was taken as part of my year’s long work into the secrets of the giant panda, the huge success the Chinese have had breeding them and The Chinese and their current work releasing them into the wild, where the animals and their habitat face risks. All photographs are printed by the fine art studio of Paper & Ink on archival paper which is designed to meet museum longevity requirements.